Rashid Khan has become a household name in India after his amazing performances for Afghanistan and he started playing in the Indian Premier League. Vijay Shankar too was rewarded for his form by his selection in India’s World Cup squad. Rashid Khan and Vijay Shankar went to play gully cricket (street cricket) with local boys in Hyderabad ahead of their match against Chennai Super Kings. 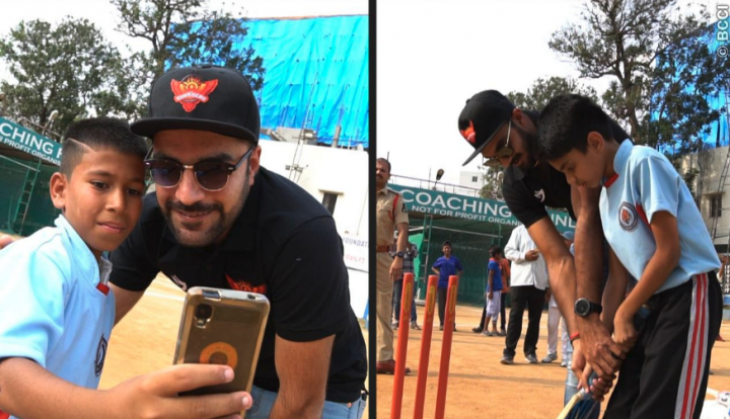 Rashid and Shankar went to a sports coaching foundation where they interacted with the kids and gave them some cricket lessons. Watch Rashid and Shankar playing cricket and having fun with the locals in Hyderabad. Vijay Shankar and Rashid Khan will host Chennai Super Kings in Hyderabad today. Both Shankar and Rashid are crucial member for their side in the IPL. Vijay Shankar recently got selected for India’s World Cup squad after his good performances for India in last 4 months. Rashid will also play in the World Cup for his country Afghanistan as he is an important member for his side. Sunrisers Hyderabad lost three consecutive matches in the IPL, while on the other side Chennai Super Kings are on top of their game having won seven out of the eight matches they played so far in the tournament. Chennai is sitting comfortably on number one with 14 points to their name, while Hyderabad is at number six with six points from seven matches. Hyderabad have some really good players in their side but their middle order have failed to perform with the bat. David Warner and Jonny Bairstow have scored 90 per cent of the runs for Hyderabad this season, while skipper Kane Williamson not looking in good form after suffering from a shoulder injury. Naagin 3: Surprise! Mouni Roy returning as Shivaangi to help Bela or is that Taamsi aka Krishna Mukherjee?